A short and sweet (or savoury) post for this simple but delicious recipe. Contains ALA omega 3 acids (for brain and heart health). Is high in calcium and extremely high in vitamins A, K and C; more vitamin C than an Orange! 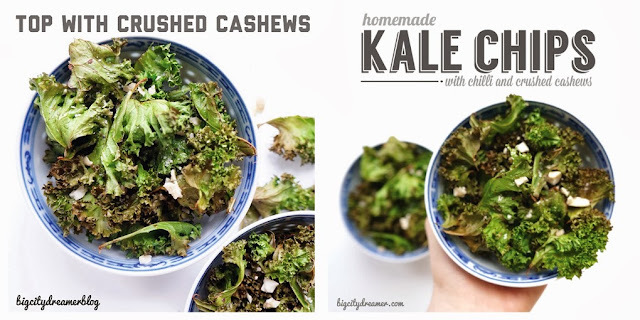 It also contains carotenoids which become more readily available to the body when kale is combined with healthy fats like those in olive oil and nuts (two ingredients in this recipe). Wash 4 large curly kale leaves. Dry thoroughly before tearing into smaller pieces. 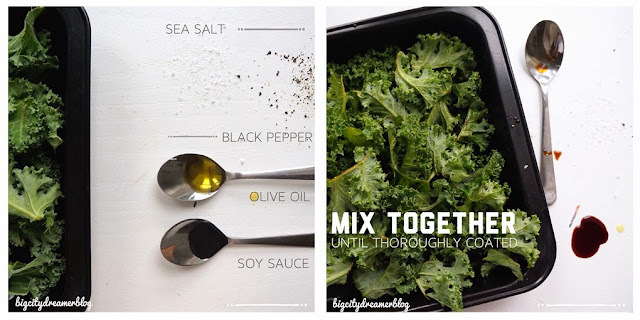 Coat with 1.5tsp olive oil, 1tsp soy sauce and sea salt and black pepper to taste. | Mix thoroughly to ensure they are all coated. Bake in a preheated oven at 175 degrees C (350 degrees F) for 6-12 minutes. 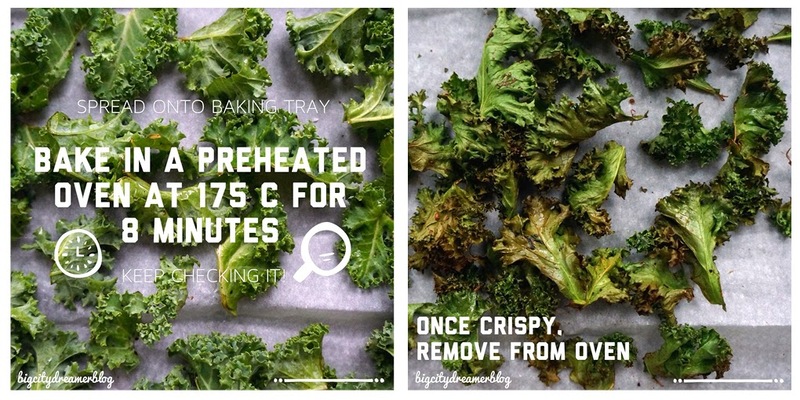 | Once crispy, remove from the oven. Once cooked, top with crushed cashews, chilli powder or sesame seeds. 1. 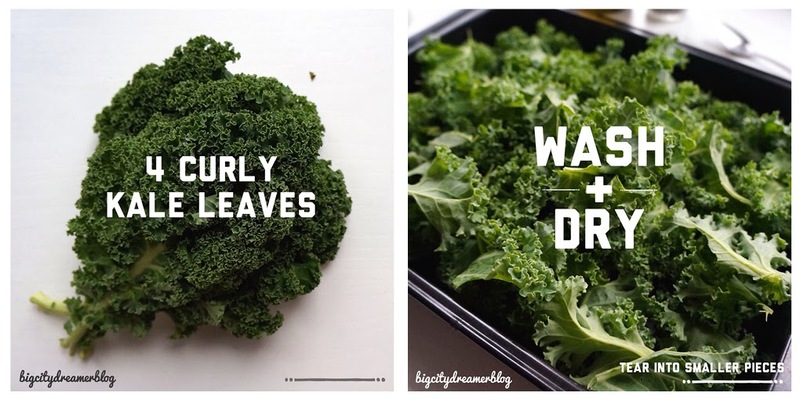 Wash 4 large curly kale leaves. Dry thoroughly (very important!) before tearing into smaller, bitesize pieces. 2. Coat with 1.5tsp olive oil, 1tsp soy sauce and sea salt and black pepper to taste. Mix thoroughly to ensure they are all coated. 3. Bake in a preheated oven at 175 degrees C (350 degrees F) for 6-12 minutes (depending on your oven). Keep checking to make sure they don't burn! 4. Once cooked, top with crushed cashews, chilli powder, sesame seeds or whatever topping your heart desires!